From A newspaper cutting of 20/1/1919, I assume its either the Telegraph or Independent. Dolphin street, a more or less insignificant thoroughfare in the East End of Sheffield, has a magnificent war record, the story of which is to be handed down to future generations in a permanent form. Out of a total of number of 48 houses in the street, 55 men have fought in the Great War, and in addition, every female able to work has devoted her time to duties of national importance. Of the 55 who went as soldiers, seven have died, and one is missing. Out of the number, one (Driver Joseph Drake, R.F.A.) has secured the Military Medal for conspicuous bravery at Ypres, when he dressed the wounded during a perfect volcano of shell fire; whilst another soldier, Private T. Elkington, who obtained his ribbon, was killed just after his last leave. 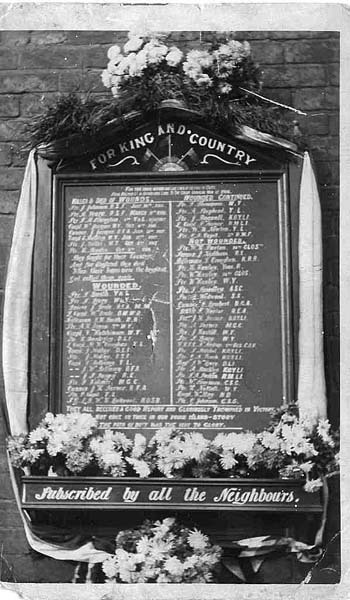 To perpetuate such a wonderful record one of the residents in the street, Mrs. Bagnall, inaugurated a war memorial and roll of honour, and, with the aid of other neighbours and without the slightest assistance from outside sources, has had erected a suitable shrine with the names of those in the street who have served. The interesting ceremony of unveiling the shrine took place on Saturday afternoon, in the presence of a large gathering. Mr. W. Brooks presided, supported by Mr. B. Gregory (headmaster of the Woodbourn Road Council School), who has been closely associated with a number of the boys who participated in the war. The band of the Salvation Army was in attendance and gave selections. Mr. Gregory said he did not think there was a street in Sheffield that had done so well as to send 55 soldiers out of 48 houses. In his 14 years experience as headmaster at Woodbourn Road, he had had some ‘rough pups’ to handle, but although they had been rough they knew how to live and how to die. They had done their duty without making a song about it. Mr. Brooks unveiled the memorial, and the proceedings terminated with cheers for Mrs. Bagnall and others who had been associated with the movement. This is the only 'street shrine' i've come across for Sheffield, i know there are still some still in situ, such as Hull, were there any more in Sheffield ?